Our work makes a real difference for those we work with. Discover below, just some of our life-changing stories from people who have been supported by Siloam Christian Ministries. Individuals are helping to counter abuse, exploitation and slavery on a one-to-one basis through Siloam's child sponsorship. Globally that includes areas such as Chennai, India, which is notorious for forced labour, slavery and child prostitution. With four children of her own, Jean Dickens of Nottingham always wanted to sponsor a child, particularly in India. By 2004, Jean was already a grandmother when she chose to sponsor a vulnerable child through Siloam Christian Ministries who partner with Childcare Worldwide (CCW). She began to sponsor a five year old little girl in Cennai named Dibeeka who had been in a bad situation. From Jean’s viewpoint, she sums up, ‘You don’t realise what sponsoring is like until you do it. ‘If you can encourage a child, if you can make a difference in just one person’s life, it’s got to be good. So many children in the world are going through bad things.’ Like other sponsors, she feels that she receives far more than she gives. When Jean became a Christian, she recalls that God lifted burdens from her, leaving her feeling peaceful security in His love. Now she emphasises that Dibeeka receiving an education will assure her of a secure future, free from the dangers of poverty that lead to vulnerability. Jean smiles as she says that Dibeeka has grown into a lovely young lady in her teens, safe both physically and spiritually. Can one life defy statistics? If statistics are anything to go by, then the life of Thieu Kha was fairly predictable. Born into a poor family, she would experience hardship along with approximately seven million Vietnamese children living in poverty. For Kha personally, it would mean lack of good food and basic amenities. With family members labouring hard for survival, Kha would probably become one of the 30% of Vietnamese children who are cited as working. Sadly, being a girl makes it less likely that Kha could ever obtain an education to help her break out of the cycle of poverty. Also, the risk of trafficking is prevalent. But Kha became an exception as she was one of the first children in Vietnam to benefit from the Siloam Christian Ministries’ sponsorship. That was just the start of defying statistics. 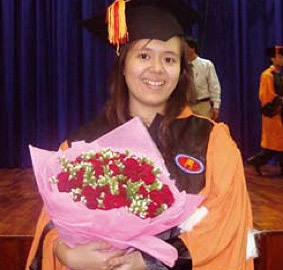 Kha excelled in her studies, graduated from university and chose to pursue a career in management. But there is something else significant. Thankful for the opportunity to turn her life around, Thieu Kha has asked to sponsor a child. She wants to feed back into the system by helping others through Siloam. ‘Perhaps the best commentary comes from the Danang Charity Association,’ says Don Foster. ‘They want us to help sponsor children who remain in need. That is the real evidence that sponsorship proves valuable to the individual, families and society.’ Don knows first-hand since the British Army sponsored him as a child in the Duke of York Royal Military School. Today he capably serves as Siloam South East Asia Voluntary Representative, coordinating sponsorship throughout the region.